Lee, K., Kwon, M. and Jeong, D. (2014). In vitro Biomineralization Assay. Bio-protocol 4(3): e1036. DOI: 10.21769/BioProtoc.1036. Biomineralization in vertebrates has both physiological and pathological aspects. Physiological mineralization is essential for proper development and function of hard tissues, such as bone, teeth, and growth plate cartilage, but it does not occur in soft tissues. Pathological ectopic mineralization, in contrast, occurs in soft tissues, including blood vessels, kidney, articular cartilage, and cardiovascular tissue. Here, we describe the simple method for detecting and measuring the presence of mineralized nodules in cardiac ventricular fibroblasts by using von Kossa and alizarin red S staining, and a colorimetric method for calcium quantification, respectively. Note: Our protocol can be used with various cell types such as osteoblasts and vascular smooth muscle cells. Cardiac ventricular fibroblast cells (2 x 104 cells/well in 48-well plates) are cultured in 500 μl of DMEM containing 10% FBS in the absence or presence of 3 mM inorganic phosphate (Pi; pH 7.4) for 6 days in 37 °C, 5% CO2 cell culture incubator for inducing mineralization. The media are freshly changed every 2 days. Note: For inducing ectopic calcification in cardiac fibroblasts by high concentration of inorganic phosphate. The cultured cells are rinsed twice with 250 μl DPBS and fixed in 250 μl of ice-cold 70% ethanol for 1 h at room temperature without any agitation. After fixation, DPBS and ethanol are removed and rinse with DDW carefully. After aspirating DDW on top of the fixed cells, add 250 μl of 5% silver nitrate solution and place the cell container in bright light such as sunlight, UV light or high-watt lamp until calcium deposits turns proper black (or dark brown). Rinse in 3 changes of 250 μl DDW briefly by gentle shaking. Rinse un-reacted silver with 250 μl of 5% sodium thiosulfate and keep for 5 min at room temperature (optional). Fix the cultured cells with 250 μl of ice-cold 70% ethanol for 1 h at room temperature. After 3 changes of washing with 250 μl of DDW, stain the cells with 250 μl of 2% alizarin red S stain solution for 30 to 60 min at room temperature. Rinse in 2 changes with 250 μl of DDW. After removal of unincorporated excess dye with DDW, the mineralized nodules were stained as red spots. Cultured cells are washed twice with 250 μl of DPBS and decalcified with 250 μl of 0.6 N HCl for 12 h.
Prepare working reagent by mixing equal volume of reagent A and B. Equilibrate to room temperature before use. Transfer 5 μl of diluted standards or samples into each wells of a clear bottom 96-well plate. Add 200 μl of working reagent and tap lightly to mix. After incubation for 3 min at room temperature, read the absorbance at 570-650 nm with 96-well reader. The remaining cells are washed three times with 250 μl of DPBS and solubilized in 200 μl of lysis solution containing 0.1 N NaOH and 0.1% sodium dodecyl sulphate (SDS) at room temperature for 5 min. The protein content is measured with a Bio-Rad DC protein assay kit. 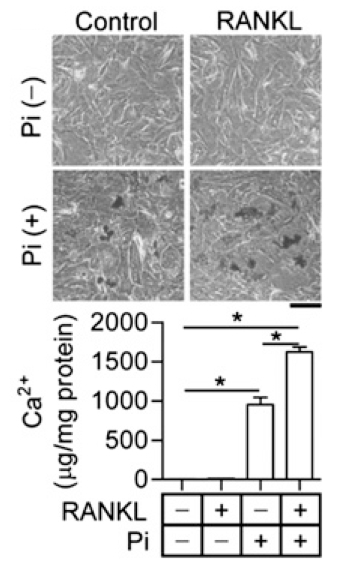 Calcium content is normalized to the total protein content of the whole cells (μg of Ca2+/mg protein of whole cells, see Figure 1). Figure 1. The synergic effect of RANKL on Pi-induced cardiac fibroblast calcification (Lee et al., 2013). Primary cardiac fibroblast cells were treated with 3 mM Pi in the absence or presence of 100 ng/ml RANKL for 3 d. Calcium content in cells was measured, and calcium deposits were visualized by von Kossa staining. A representative image is presented in the top panel. Scale bar, 100 μm (upper panel). Calcium contents were measured by QuantiChrome Calcium Assay kit (lower panel). Quantitative data are means ± SD (n = 3). Dissolve 2 g of alizarin red S (sodium alizarin sulphonate) in 100 ml DDW and the pH was adjusted to 4.1-4.3 using 0.5% ammonium hydroxide. Dissolve 1.2 g of NaH2PO4 in 10 ml DDW and the pH is adjusted to 7.4 using NaOH. This protocol was adapted from the previously published report Lee et al. (2013) and the QuantiChrome Calcium Assay Kit manual. Lee, K., Kim, H., Park, H. S., Kim, K. J., Song, H., Shin, H. I., Kim, H. S., Seo, D., Kook, H., Ko, J. H. and Jeong, D. (2013). Targeting of the osteoclastogenic RANKL-RANK axis prevents osteoporotic bone loss and soft tissue calcification in coxsackievirus B3-infected mice. J Immunol 190(4): 1623-1630. QuantiChrome Calcium Assay Kit manual. http://www.bioassaysys.com/file_dir/DICA.pdf. How to cite: Lee, K., Kwon, M. and Jeong, D. (2014). In vitro Biomineralization Assay. Bio-protocol 4(3): e1036. DOI: 10.21769/BioProtoc.1036. For Calcium quantification, Do I have to add the decalcifying solution, 0.1 N HCL, on cultured cells after washing with DPBS? Can you tell me more or send me your decalcification protocol? The 12 hours incubation at what temperature? do i have to incubate it on a rotator or shaker? To quantify calcium, cultured cells need to be washed twice with PBS and decalcified with 0.6 N HCl for 12 h under room temperature. You do not need to incubated cells on a rotator or shaker.